Planz.com - Start here. Get everywhere. Planz - start here, get anywhere! and booking site - all wrapped into one! 1. Explore the site for travel ideas and vacation packages with complete itineraries created by travel experts. 2. Plan your vacation by cloning planz, customizing details, and collaborating with friends to keep everyone happy. 3. Book your trip and get traveling! Access all your important travel info on the go with our planz app. Share your adventure. Upload pictures, videos, and journal entries to let friends and family follow your adventure from afar! When you’re back from your travels, create a slideshow to show off everything you did in detail. Are you planning a vacation, but don’t know where to start? 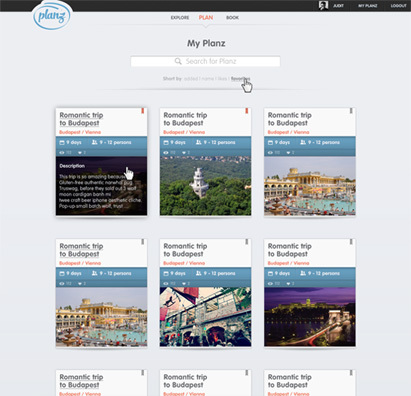 Explore Planz for not only inspiration and ideas but also complete travel itineraries. Search by destinations, themes, budget, activities, events, etc! Looking for a romantic getaway in Italy? How about a bachelorette weekend in Vegas? We’ve got planz for any destination vacation you can think of. Can’t find any planz that fit exactly what you’re looking for? No worries - create your OWN planz from scratch in a simple step-by-step format using as much or as little information as you have, such as travel dates, destinations, number of travelers, theme, budget, or activities! Once you’ve customized your planz, let friends and family share their input. Invite your fellow “travelers” to check out your ideas for the trip and give their own, or let experienced travelers and locals give you their expert opinion as “contributors” - they might know about must-sees, must-eats, and must-dos that simple travel guides never mention! Unlike some websites, Planz is not just an idea and discussion board - we want you to get out there and travel! One of the most important features is your actual itinerary, which allows you to organize your ideas into coordinated, meaningful planz, complete with details for each day of the trip, including flights, hotels, transfers / transportation, activities, dining and more! After all the planning is done, travelers can book easily directly from the itinerary, and then you’re ON YOUR WAY!